Happy Thursday! Here's a little mood music for this post. Today I offer Home by Stephanie Mills from the Broadway production The Wiz. My husband and I realized early on in our relationship that we have distinct skill sets. Because we acknowledge each other's talents, we try to let each other shine when it comes to our areas of expertise/interest/strength. One of my areas of interest, and dare I say, strength is finance. Maybe it has to do with my love of mathematics. My sister laughs at my skills to hold onto a dollar and make it stretch and grow. Maybe my knack for money management comes from years of being a teacher and "making somethin' outta nothin'" (shout out to Juvenile, Ha!). On a recent road trip home from Philadelphia, I listened to consecutive episodes of Dave Ramsey with joy (learn more about him here)! I don't always agree with him; he can get a bit right-wing for my taste, but I love his straightforward talk and conviction. I wouldn't say that finance is an area of my expertise by any stretch of the imagination, but I have a healthy fascination about getting, keeping, and growing our coins. Lately we've given our financial state a lot of attention - probably because we have a little one on the way, and realize that the baby is going to hit our pockets HARD. I've been researching childcare, and the rates bring tears to my eyes. We've also made some tough decisions. We've decided to downsize. Downsizing will allow us to reach some big financial goals before our little one is old enough to realize the sacrifice we're making and before we try for Baby #2 (Yup, I want to do this again, God willing.). Downsizing for us means moving into a smaller, but really nice, place. I'm fortunate that my job has some great deals on housing. We feel like we're making an even trade - we'll be in a newer, nicer, less expensive space, yet sacrificing some square footage. This move means selling furniture, clothes, and odds & ends that would occupy too much space in our new abode. It means making some decisions about what's important to keep and what needs to be let go. To some, our move probably won't seem that drastic. 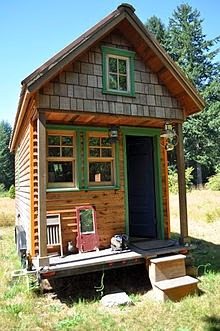 I was doing some research on downsizing and ran across folks participating in the tiny house movement. They're some soldiers. We ain't built for that. So cool, yet so not for us. Picture borrowed from here. I decided to title this post based on a conversation I was having with my girlfriends about our decision to downsize. I was talking about making the transition, and told my girls, "I just told my husband that home is wherever he, Tyson, and the baby are." After stepping back from the comment, I realized that it was sappy my deep-down truth. I mean it. As long as I've got them I'm alright. I learned this lesson early in life. When I was young, my family moved around quite a bit. So whenever I would think of home, I would think of people, not necessarily a specific house. Well now I'm extending this same line of thinking to the family we're creating, not just to my family in the South. We hate debt. Debt takes money out of our pockets for saving or doing other worthwhile things. We don't make any purchases that involve exorbitant interest rates. Less is more - even though I still don't believe this when it comes to shoes. I'm working on it, y'all. Being debt-free is our goal, and it is possible. Sacrifice in the short-term is worth it for the long-term. I'll be revisiting this post as I start to tag items to sell and as we have heated convos about what stays and what goes. It's hard putting theory into practice, but we're determined to do it. Onward and upward, y'all.!! !